The Ridge is the perfect place for a couple to relax and recharge. The views are spectacular! 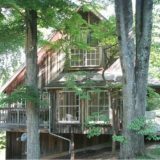 2 BR, sleeps 4. $129. Children Welcome, Pets Welcome, Smoke-Free Property.